The Elephant Tango Ensemble was an artist collective focused on community, creativity, and excellence. Founded in August of 2008, it was comprised of a collective of musicians, actors, puppeteers, designers and dancers striving for creative excellence through making puppets, composing music, and preserving storytime. My contributions included included voice acting, puppeteering, audio recording, and some music composition. 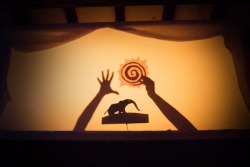 The Elephant Tango performed at the Cloud Club, Brookline Music School, Club Oberon, Perishable Theatre, Puppet Showplace Theatre.